First and foremost, by joining our membership scheme you are helping to sustain the local journalism that we produce day by day on the web. 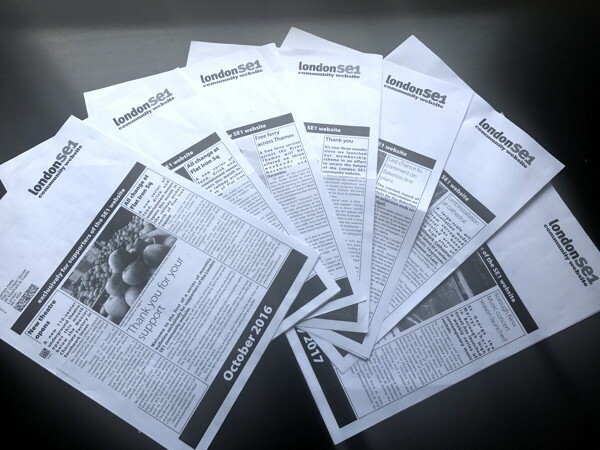 To say thank you for your support, we produce a monthly four-page printed newsletter exclusively for our paying subscribers. It draws on the heritage of 'in SE1', our monthly print publication we produced between 1998 and 2014. But this time, it's just for members. Each edition should arrive in the post around the 1st of each month. Only those subscribers with a 'live' subscription on the day that the mailing is sent to our printers will receive the printed bulletin. We offer two payment options: Direct Debit with GoCardless or credit/debit card with Paypal. Prefer to make a one-off contribution to the SE1 website? Sponsor an hour of journalism.